Stock Picks D-Mart: Still a Multibagger? 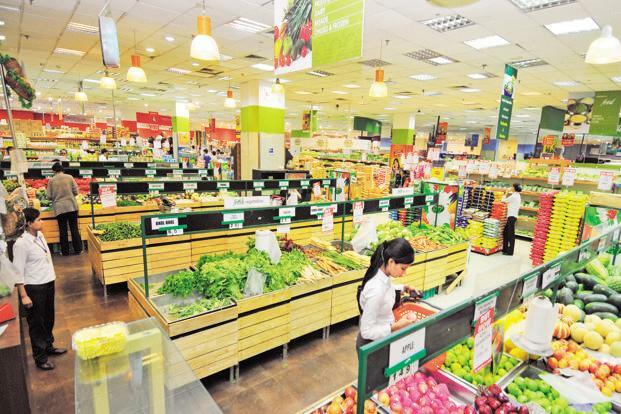 Avenue Supermart – The RK Damani held supermarket company had a stellar listing on the Indian stock exchanges. Investors who got allotment made and held on to it are already looking at a 150% gain and the stock could soon turn into a 3x multibagger. We had given a BUY recommendation with a detailed research report to our members during the IPO. Some got allotment, some didn’t get allotment. IPO investors are wondering wether they should hold on to their investment, book some profit or just sell out all the shares. Others are wondering if they can buy at current prices and hold on for multibagger returns. This post will definitely help you decide on DMart’s future prospects. We will look at some factors that help us identify multibaggers. The Indian retail industry accounts for over 10 per cent of the country’s Gross Domestic Product (GDP) and around 8 per cent of the employment. It is is expected to nearly double to US$ 1 trillion by 2020 from US$ 600 billion in 2015, driven by income growth, urbanisation and attitudinal shifts. Can DMart tap this potential to deliver the multibagger returns? Yes, they have demonstrated superior performance to peers who have struggled to be profitable in the retail segment. 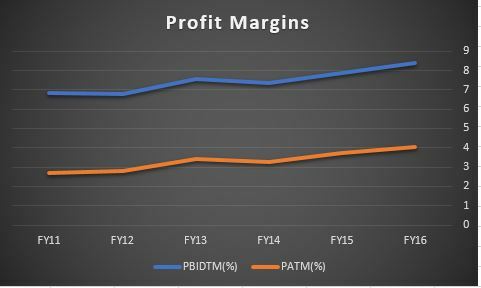 DMart has consistently increased profits and improved margins. These factors should carefully be analysed by investors who are looking for Multibagger stocks in their portfolio. 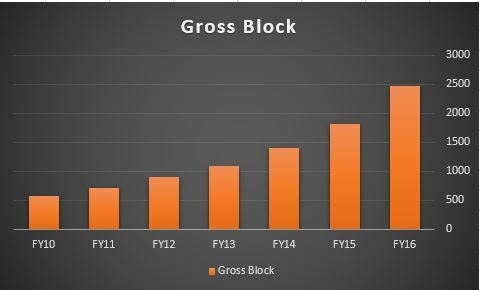 DMart has maintained a very high rate of growth over the last five financial years. The beauty of this rapid growth lies deeper than the 35%+ number that it is showing as its growth rate. Now how can a retail store push up its turnover? By selling more from existing stores OR opening new stores. DMart has done both! The company has increased its Gross block at a CAGR of 27.73% in the FY10 to FY16 period. 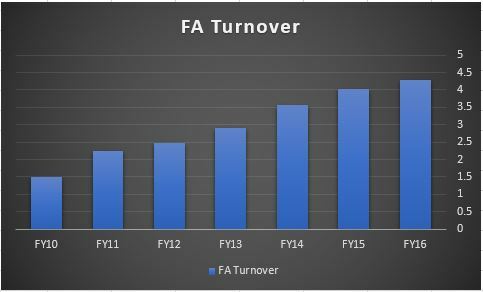 And in the same time the Asset – Turnover ratio has increased. This means that the company is generating higher revenues per rupee of asset invested in. Now, Asset turnover usually has a negative correlation with the profit margin because it is generally assumed that to sell more goods from the same store, you’ll have to reduce prices and offer better discounts. Walmart had used this strategy to its advantage by pushing up Asset turnover and slashing margins thereby generating higher absolute profits. This, at a time when competitors were very cautious of their margins. DMart has defied this negative correlation till now. Just look at the profit margin trend. Increasing assets, improving asset turnover and margins. Maybe the company is doing this at the cost of cash flows? As per the Balance sheet for FY17, the company collects cash in less than 1 day and has to pay its creditors every 9 days. This actually creates a business wherein the company has negative working capital requirement! Now all this has favourably worked in favour of the shareholders and the company has seen rising Returns on Capital Employed and Returns on Net Worth. 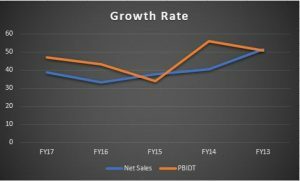 The above charts speak a lot of the business and brand strength of DMart. Will we want to own this business? ABSOLUTELY. Can DMart give multibagger returns from current price? Well, explosive growth companies won’t come at PE of 20 or 30. 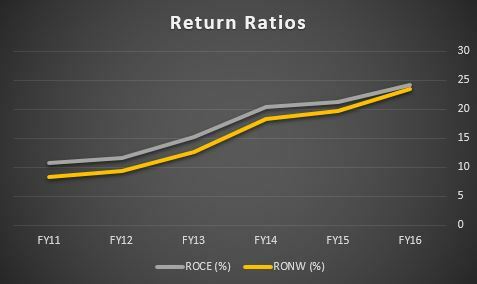 With low interest rate environment, you might have to pay a higher premium for DMart type of stories ~ India focussed, consumer and consumption led growth, strong financials. This multibagger is bound to attract fund flows from Indian and Foreign Institutional Investors.